Researchers here at the New England Aquarium under the auspices of the Consortium for Wildlife Bycatch Reduction are working on a new project to understand right whale entanglements by conducting eye exams! To figure out if there is a way to make the rope more visible to a right whale to avoid entanglements altogether. Whale vision is not the same as human eyesight and it is important to determine what colors they see. 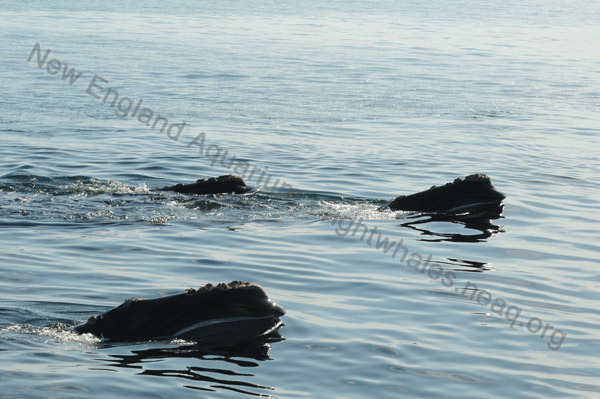 Using PVC piping instead of rope (to avoid any chance on entangling the whales), they are placing white, red, green, black, and “glow in the dark” rope mimics in the water anchored by buoys near whales currently skim feeding in Cape Cod Bay. 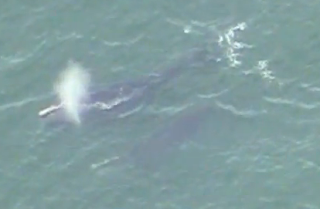 Video still of right whales feeding off the coast of Cape Cod. Go to this post to watch the entire video and get details. The experiment is being headed by Vice President of Research Dr. Scott Kraus, who runs the Right Whale Research Project at the Aquarium and is also known for his work co-editing the Urban Whale: North Atlantic Right Whales at the Crossroads with Aquarium Senior Scientist Dr. Rosalind Rolland. Also participating in the experiment are researchers Dr. Amy Knowlton, Marilyn Marx, Marianna Hagbloom and Monica Zani.